Red is an 8-month-old neutered male. He is a red tabby, hence the name Red. He came to us through a transfer we did from North Bay, Ontario. Red is your typical kitten. He loves to play with toys, and really enjoys giving himself a good scratch on his arch grooming toy. When you come to see Red in his cage, he will greet you happily and beg for your attention. He is an extremely friendly cat who is dying to find his home, where he can get pet and loved on daily. Clearly he is not just a big ball of energy, he does also enjoy his naps from time to time (which is the only time to take his picture as he is always trying to get into your arms). 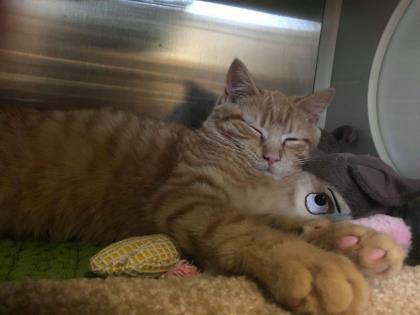 If you are looking for an all around amazing cat to join your family, come check out Red at the Quinte Humane Society, 527 Avonlough Road, Belleville. Kitten Adoption fee of $140 includes; $65 neuter/$100 spay discount voucher, first vaccination, general deworming, advantage if needed, microchip, four weeks of free trial pet insurance and a free exam at a local participating vet.